London has long been a hotspot for property buyers looking to live and invest. Today, the capital is still the most popular investment opportunity with house prices predicted to rise over the next five years. But where is the best place to invest? Enfield and Dalston are growing districts but are there other areas with potential? 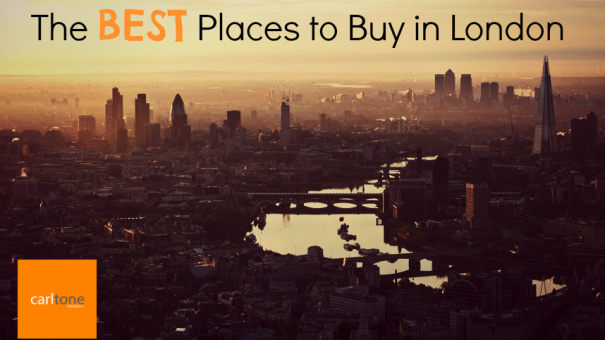 Here we will look at some of the best places to buy. Bordering Hertfordshire and north of London, Barnet is quickly becoming a popular community for young professionals and growing families alike. Said to offer the best of both the city and the country life, Barnet features great open spaces and rolling fields, coupled with excellent transport links into London’s CBD. The area has a variety of properties, from pokey flats to gated mansions and is a desirable spot for many, with lots of room for growth. Another residential hotspot for twenty-something’s, Rotherhithe is the go-to for those who can’t afford the Shad Thames or Borough properties. And with a number of large-scale property developments in the area, there are plenty of opportunities for growth and investment. With the Thames foreshore on your doorstep and a number of public transport options in the area, this is another great place to buy. Although prices seem a little high in this region, the price per square foot is actually incredibly affordable and can make a great investment with prices only looking to rise. The area is full of trendy warehouses, new flats and indulgent restaurants, known for its sought after properties. Right on the East London Line, the Tower Hamlets offer the proximity and price any investor will love. Known for its amazing views of London from Horniman Gardens and great local cafes and bars, Forest Hill is a popular spot for first home buyers and investors. An affordable area just half an hour from central London, Forest Hill is an investors dream, attracting families and young professionals as tenants. West of London, Ealing is commonly thought of as typical inner suburbia, popular among middle-class families who want luxury without the price tag. With detached houses and apartments available, there is something for any tenant or investor, with new developments on the up in recent years. The area is also along the proposed east-to-west London railway set to open in 2018. To find out more about these up-and-coming investment opportunities, including property prices and property management, talk to the experts at Carltone today.